September 4 - October 31, 2014. Bischoff Projects Frankfurt/M. 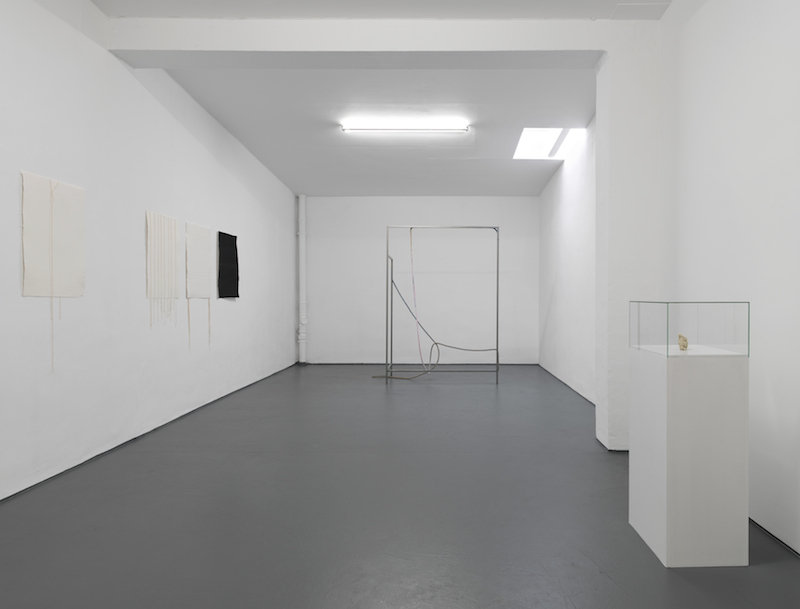 Bischoff Projects is pleased to announce an exhibition of works by N. Dash, David Keating, Jens Risch, and Fred Sandback that discover line through the means of the string. Fragile and permeable, the works on view achieve volume and presence not with mass, but rather by using the contours of their impressionable materials. These four artists recast line as a means to measure the faintest presences of time, gravity, and space through works of sculpture, mixed media, and installation. 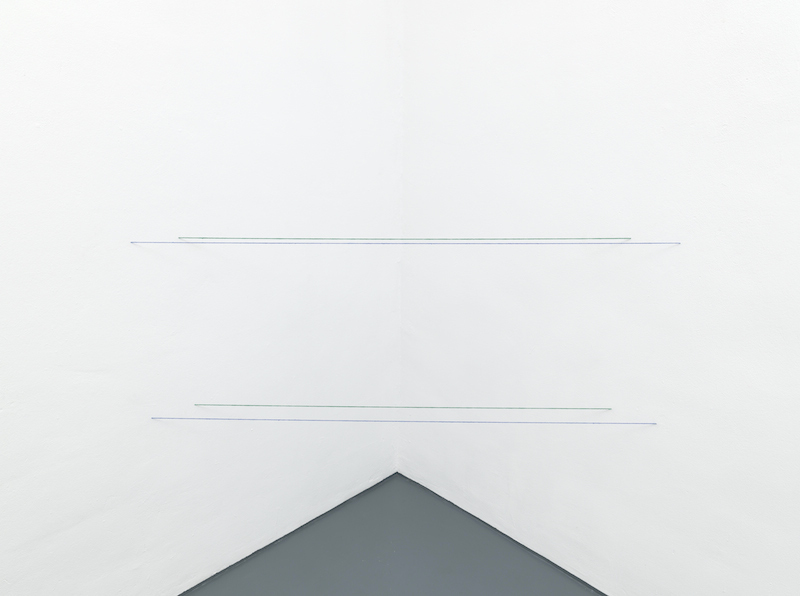 The influential Minimal works of Fred Sandback sought sculptural definition without interiority – mere line itself could gesture at space and depth. As the artist wrote in 1975, “the line is a whole, an identity, for a particular place and time.” An untitled work of acrylic yarn circa 1972 activates the gallery walls as viable sculpture, with four parallel blue and green lines stretched tightly across two perpendicular walls. The corner is recast from containment to sculpture, art’s confines expanded into a site of art making. 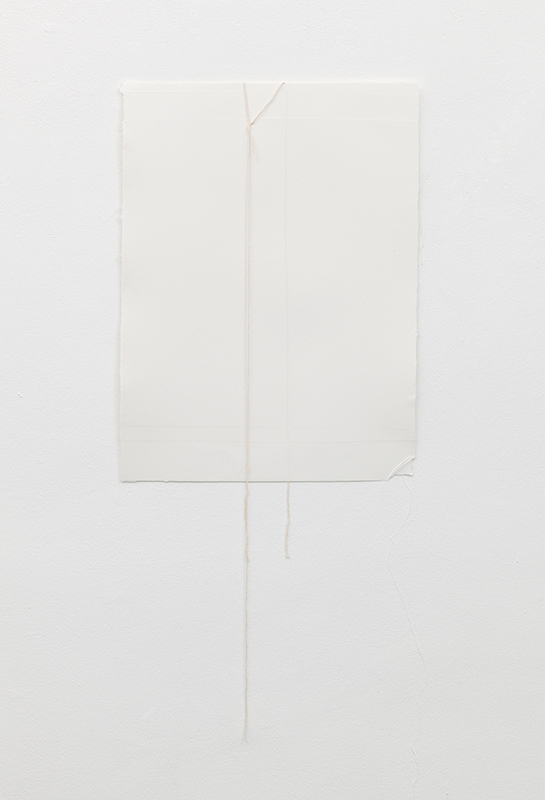 Jens Risch’s work explores this idea’s inverse, compressing the possibilities of the line into definition. Risch uses hundreds of meters of silk to create his small and globular sculptures, which represent months and even years of diligent knotting by the artist. Here, too, the line signifies time, but Risch rather draws our attention to our ability to master it, though such control inevitably yields unpredictable, organic results. 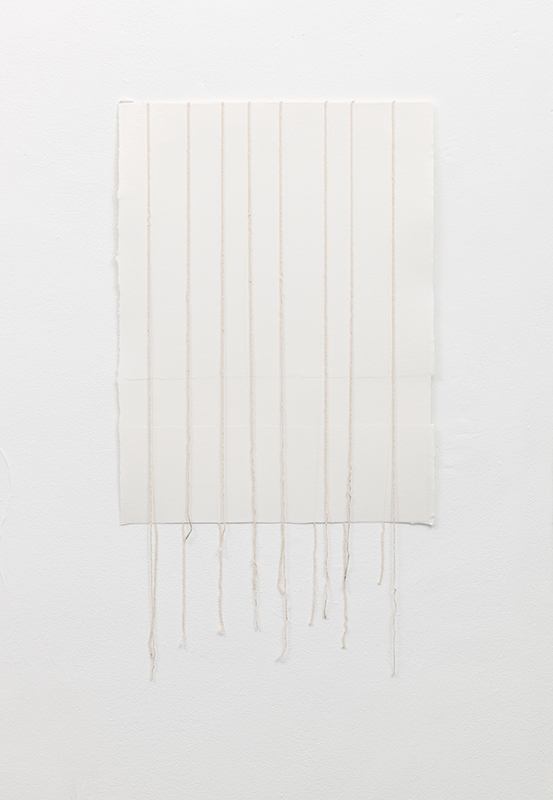 Risch conjures mass from what is almost ephemeral – by disrupting the string rather than following the through line of his material, the artist creates unexpected gravity. 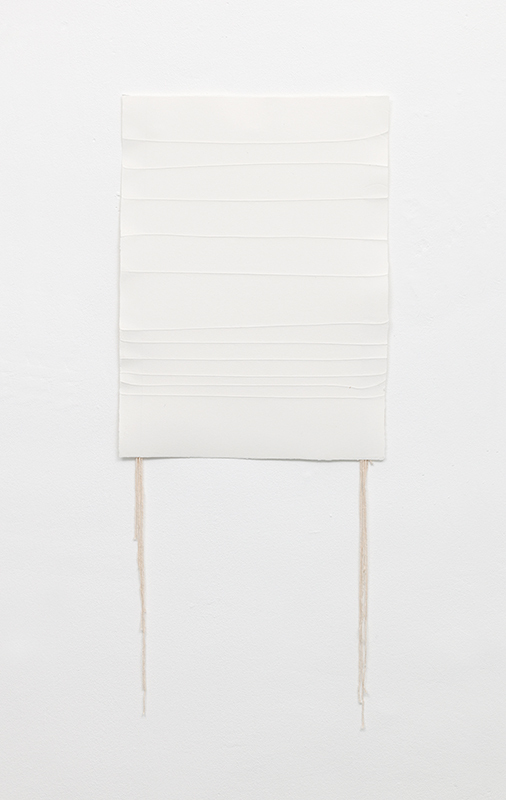 In a new series of untitled work by N. Dash, strings neither support nor attach any foreign object, but rather, they become the focus of tension themselves, embedded along and across bare handmade sheets of paper. Dash’s work often references architecture and with these pieces, the structure of the paper provides both the housing and plane for the line. 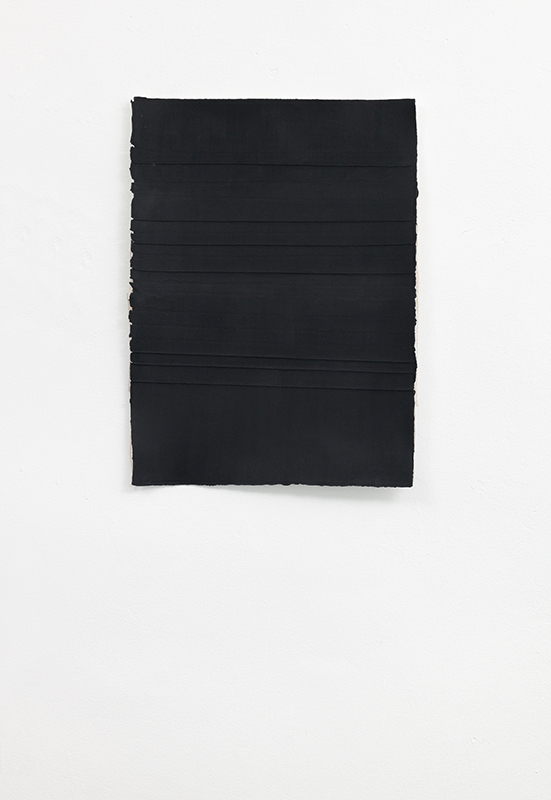 As Sandback offered empty space between his lines as material so does Dash present these works as space to be measured. 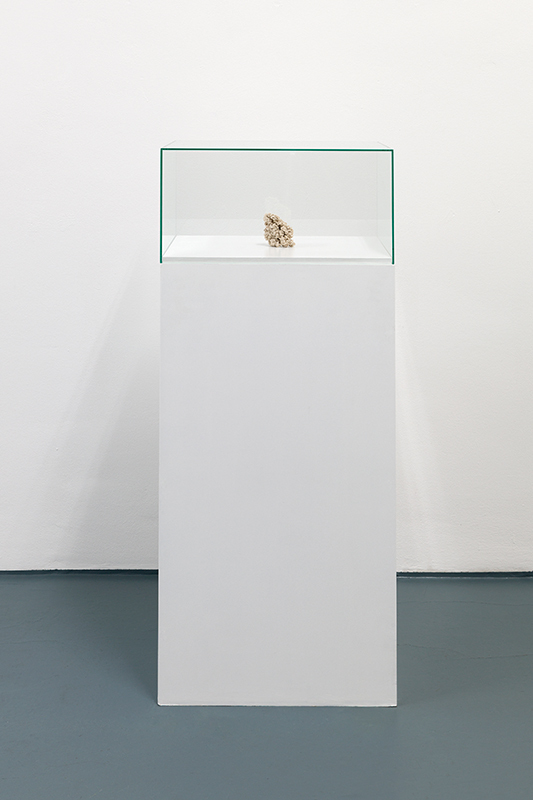 The work of David Keating also gestures at such juxtaposition in three dimensions, dealing with the interplay between the taut and the slack. Rigid steel lines have been set off by sagging colorful ropes that twist and attach to the structural components of the work while subtly changing hue. 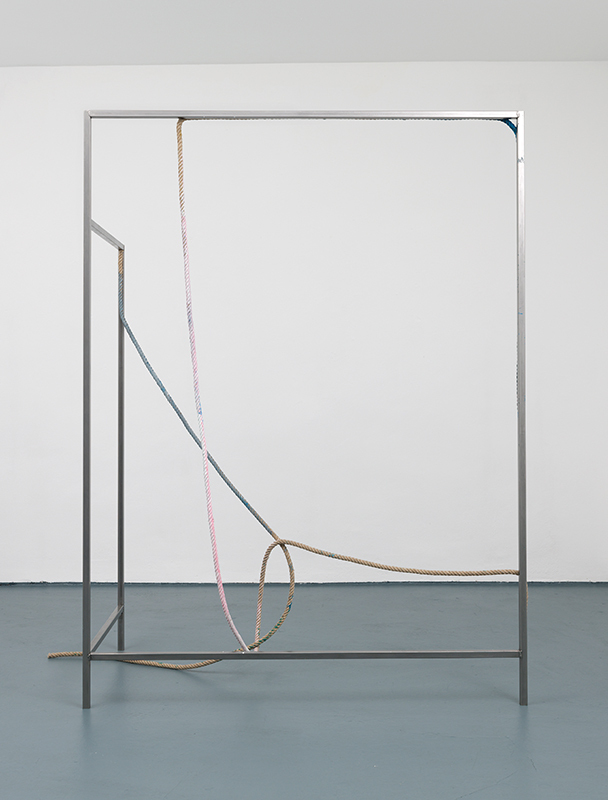 As these structural forms define how the viewer moves through the space, so do these ropes redefine that relationship, suggesting that such supports can also serve as leverage for looser, animated forms. 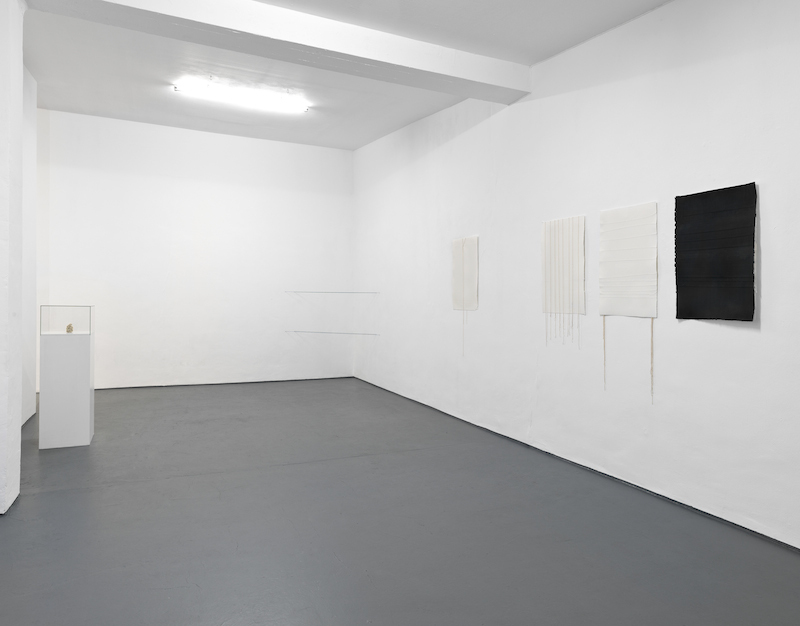 These four artists challenge the singularity of the line by stretching or compressing its definition through their work – the string here transforms from practical instrument into probe for mystery, revealing relationships otherwise barely perceptible.